Stuttgart. Two world debuts marked the highlights from Dr. Ing. h.c. F. Porsche AG, Stuttgart, at the 2009 Geneva Motor Show: the 911 GT3 and the Cayenne Diesel. Presented for the first time to the public, these two models impressively symbolise the particular fortes of Porscheâ€™s model range focusing on both tradition and the future â€“ dynamic performance and superior economy. The new 911 GT3 is once again more powerful, faster, crisper and more dynamic than its predecessor, improving above all in its two core features performance and driving dynamics. Maximum output of the proven normal-aspiration six-cylinder is now 435 bhp (320 kW), up 20 bhp over the former model. Performance on the road improves accordingly, with the new GT3 now accelerating to 100 km/h in 4.1 seconds and achieving a top speed of 312 km/h or 193 mph. High-tech aerodynamic modifications add to the new look of the GT3 and increase the carâ€™s down-forces most substantially, more than doubling down-pressure over the former model. 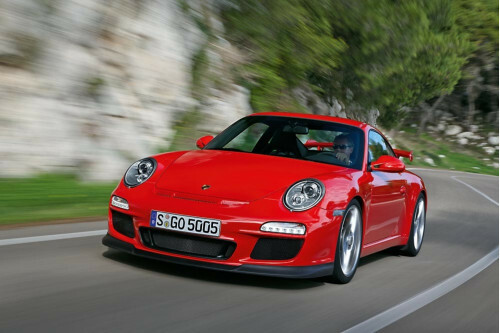 As a further improvement, the Porsche GT3 comes for the first time with particularly sporting PSM Porsche Stability Management switching on and off in individual stages. Porscheâ€™s second new model launch in Geneva is the Cayenne Diesel. The combination of Porscheâ€™s particularly dynamic and versatile SUV with a very economical, high-torque power unit offers significant advantages above all on long distances and when towing a trailer. Added to this there are the outstanding driving dynamics, safety and offroad qualities for which the Cayenne is widely lauded the world over. From outside, the new model comes with the same looks and appearance as the Cayenne with its V6 gasoline engine and likewise boasts the Cayenne model designation on its tailgate. Displacing three litres, the extra-smooth and refined V6 power unit develops maximum output of 240 bhp (176 kW), sufficient for a top speed of 214 km/h or 133 mph. What is even more remarkable is the engineâ€™s superior torque peaking at a remarkable 550 Nm or 405 lb-ft at just 2,000 rpm. Accelerating to 100 km/h in 8.3 seconds with its Tiptronic S transmission featured as standard, the new Cayenne offers superior qualities also in its performance, thus ensuring that typical Porsche style in every respect. The absolute highlight of the new power unit is of course its supreme economy: Average fuel consumption of 9.3 litres diesel/100 kilometres, equal to 30.4 mpg imp, gives the new Cayenne with its 100-litre (22 imp gal) fuel tank an exceptional range of up to 1,000 kilometres or 620 miles. The Cayenne Diesel comes exclusively with Porscheâ€™s six-speed Tiptronic S automatic transmission. Likewise featured as standard in the Cayenne, PSM Porsche Stability Management has been specifically geared to the characteristics of the diesel engine, while intelligent PTM Porsche Traction Management provides an ideal symbiosis of very good onroad and offroad driving qualities, spreading out engine power appropriately between the front and rear wheels.